The object of a 12 car rally is to traverse the entire route correctly; recording all the Code Boards (PC’s), visiting the Time Controls in the correct order and arriving on your due time. Penalties are applied for not completing this correctly. To add to that it has a competitive element, 12 cars are the first step that many top rally crews competed on in their early years. 2; Stay in the event. This means getting to all the time controls within maximum lateness. 3; ASK if unsure about anything. 4; Drive safely, it is competitive but NOT a road race. CB = Code Board (usually an old car number plate on a stake positioned on the verge. LWGT = Long Way round Grass Triangle. WD = Wrong direction approach. STC or TC = (Standard) Time Control. Manned & identified with a ‘Control’ board. Try and arrive at the start 30 minutes before the event is due to start. Correct route to be used once only. Cars will leave the start at 1 minute intervals. If unsure of anything, ASK. Even a marshal can help you if struggling. Once signed on read ALL instructions carefully & plot anything that is required. Mark the route to one side of the roads on the map, accuracy is not important and don’t cover up detail such as Spot Heights. If your navigator can plot on the move, drive very smoothly and steady until they have the route on the map, better to be travelling at 25mph than stood plotting if possible. Driver, please take notice of your navigator and work as a team. Only two auxiliary lights allowed (spotlights) and are not to be used in any 30/40mph zone. If you are ask to plot a BLACK SPOT it means avoid at all costs. If you get into the shaded area on the right side of time card you will be OTL so if you are getting close to being OTL you may have to cut a bit of the route, better to do this and get a penalty than not finishing the rally. If you are 3mins late a TC2 you need to be the same amount late at following controls unless the time card specifies you can make up time. Never book in earlier than your DUE time. The use of electronic aids i.e; Sat nav and GPS is prohibited. Anyone using such systems will be excluded. Driver & Navigator of course. Standard production car is fine, it can have a roll cage in it but must retain all interior trim. Map reading light (12 cars take place in autumn/winter evenings). This can be a head torch or a torch taped to a fold down sun visor or a proper flexible map light. Map board (not solid for safety reasons) made out of sturdy cardboard is ideal. Approx 450mm x 450mm is an ideal size. Too wide and it will interfere with the driver changing gear. OS 1:50000 map/maps as indicated by the organisers. Romer, helps to plot Map References accurately. Clip board for putting Time Card on. Protractor (for more advanced navigation). Function of a Romer, as you can see it has also sorts of gizmos, top right hand corner is what you use to plot on a 1:50000 map. It is divided into tenths of a kilometre, this helps to plot a six or eight figure map reference accurately. 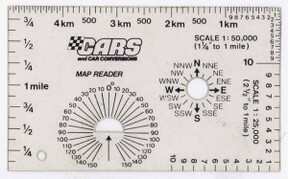 It also gives you compass directions, 16 main ones are generally used for rally navigation. Also compass bearings using degrees is occasionally used, zero is north, go clockwise and north will become 360 degrees (this diagram has split into 180 degrees both ways). Down the left edge you can measure off map in miles. This is where the marshals sign your card at controls, also where you record your code boards (CB) in the PC boxes. Across the top is Names, Car, cc, to be filled in and your running order top right (car 1). Left column is the time controls you have to visit, MTC is always at start & finish. Second column is the time in minutes you can make up but only if you have dropped time at a control (more on this later). Third column is the time allowed in minutes to complete a section. Forth column, avoid using. If you go into this area you will be penalised 2mins for every minute. Fifth column is each competitors due time of arrival at controls, MTC1 you leave at 20.01, due at TC2 at 20.06 & so on. The organisers usually tell you that car 0 will start at 20.00 hrs so if are car 1 you just add your start number to this to get 20.01, car 8 it would be 20.08, on this time card it gives you your start time but some may not. At TC5 you due time will be 21.04. Sixth column is the main one where the marshal will circle the time you ask for and sign far right. If you come into the control from the correct direction the marshal will tick approach box, if from the wrong direction he will write WD. You need to avoid going into the shaded area as this means you are OTL for that section. Early controls usually have 10/15mins with later controls giving you longer before going OTL. If you look like going into the shaded area you may want to consider cutting part of the correct route to get to the next control earlier therefore giving yourselves a bit of breathing space. The PC boxes is where you record the code boards and get the marshal at the next control to sign for them in box below. NOTE. 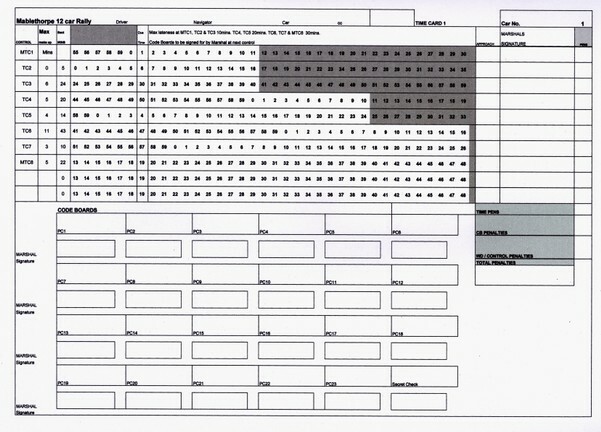 Time card layout does vary with different organisers, but the basic information will be there so ask if unsure of anything. Right, you are car 1, you set off from MTC1 on your due time and arrive at TC2 at 20.05 (1min early). Tell the marshal you require 20.06 (due time), they will circle that number and give you a signature and sign for any CB’s. The marshal will let you go on 20.06, don’t go until he tells you to at which point he will give you the next set of route instructions. If you manage to get a circle at every TC in the Due Time column you will not have dropped any time. NEVER book in earlier than your Due Time column. At TC3 you arrive at 20.33 having dropped 3mins, the marshal will circle 20.33 and sign card. Now you must keep in that column at TC4 so your due time at TC4 will now be 20.53 but you arrive another 8mins late so you ask for 21.01, which the marshal circles and signs card. TC5 your due time is now 21.15 but you arrive at the control at 21.10. Column two can now be used as you can make up a max of 4mins so 21.15 minus 4mins means you take a time of 21.11. Marshal circles 21.11 and signs card. If you arrive early at TC6 (due time now 21.54) you can get yourself back in the Due Time column hopefully. You don’t have to use all of the make up time, only enough to get you back in your Due Time column. If for some reason you get into the shaded area at MTC8 you will be excluded from the results, all other controls you only get a penalty. So to sum up the Time Card, keep in the Due Time column if possible, never before. Make sure the marshal circles the time YOU want and signs your card. Get your PC’s signed for. It is the navigators responsibility to get these done correctly, not the marshal’s. Before you hand your card in at the finish make sure you have filled in the top line. You can visit www.vscc.co.uk/vsccMedia/1946.pdf which will show different types of navigation which can be used. Don’t try and take all the information in, only competing will give you experience to become an expert crew. Going out to marshal on an all night rally gives you a good insight of what is involved. If you are interested contact Mick Smith cybermick2@btinternet.com or if you want to compete or become a Mablethorpe club member.